The oil, from the seeds contain nutrients beneficial to skin, especially beta carotene, a natural protection against the effects of UV rays. 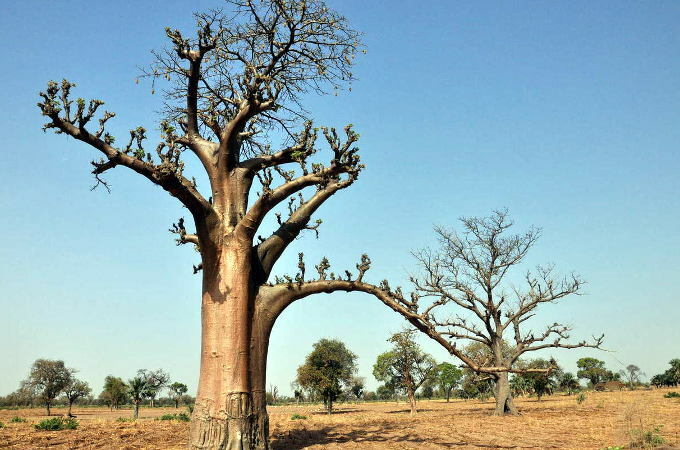 Baobab is a good stable oil and robust in heat and is a most excellent emollient. Our Baobab has been fairly traded. Native to Africa, the baobab tree is a most unusual tree to behold.Â Huge and strange looking.Â Legend has it that the gods took the baobab tree and planted it upside down.Â It can live to be 3000 years old and grow to an incredible 25 metres in diameter.Â It produces blossoms that last for only 24 hours and it is said that picking the blossoms would bring bad luck. Between May and September, it produces large seedpods containing up to 30 seeds.Â Pounding the mature pods helps to remove the seeds and a flour for cooking is produced from this dry pulp.Â The seeds can be eaten fresh or dried/roasted, often used to make a coffee-like beverage. The oil, from the seeds contain nutrients beneficial to skin, especially beta carotene, a natural protection against the effects of UV rays.Â High in omega 3, 6 & 9 as well as vitamin C and D.Â Baobab is a good stable oil and robust in heat and is a most excellent emollient.Â In its unrefinded state, it has a characteristic, nutty-like aroma.Â Outstanding in balms, butters etc...Â particularly for lip and body care.